This bathroom furthers the peaceful feel of the heritage home it forms part of. 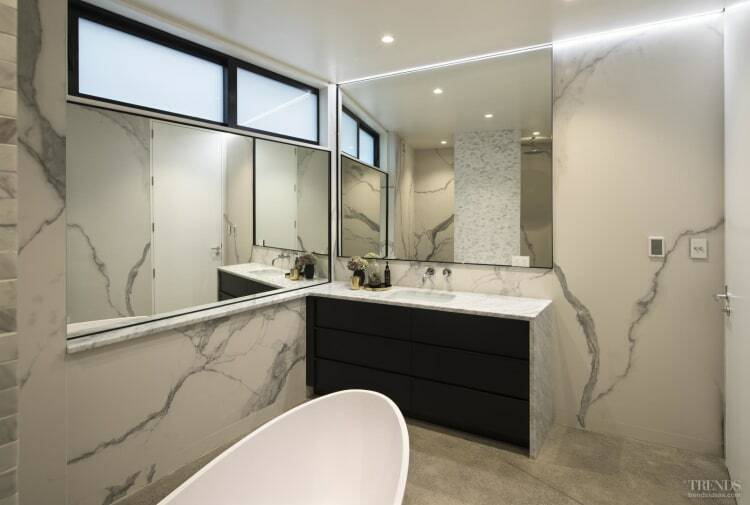 The bathing space, by architect Jonathan Smith, is in a new subterranean area of the home and includes a contemporary material to achieve its classic feel. Located on a cramped, steep site on a busy residential street, the once dilapidated 110-year-old villa had been transformed over a two-year period into a refined, highly functional family home. 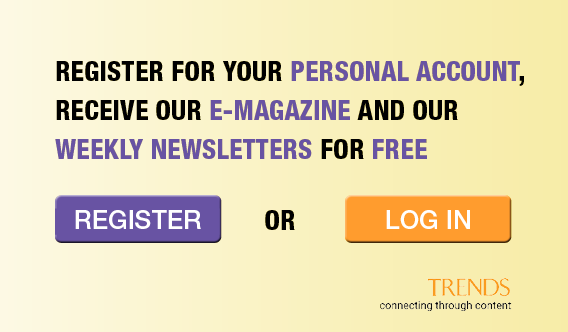 It now offers a sense of tranquillity and respite from the owners' busy city lifestyle. And within this context, the new master bathroom provides a favourite place to relax. The traditional-meets-modern bathroom is part of an entire new downstairs floor created by carving out portions of the villa, addressing major retaining work and adding masonry walls. "Everything about this bathroom furthers its pampering aesthetic," says Smith. "The first room encountered at the base of the stairs, the bathroom has high windows in opaque glass that offer natural warmth, privacy, and light." Further in, the room becomes subterranean, adding to the sense of privacy, cosiness, and sanctuary, while the heated concrete floors bring added warmth and a solid, grounded feeling. 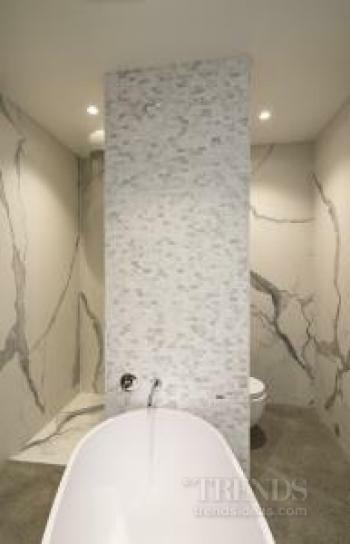 Playing a key part in the spa-like aesthetic, new-to-the-market Statuario Florim oversized panels provide the dramatic wall finishes to the bathroom's perimeter walls. "The panels' generous proportions evoke the feeling that the space is carved out of solid marble," he says. 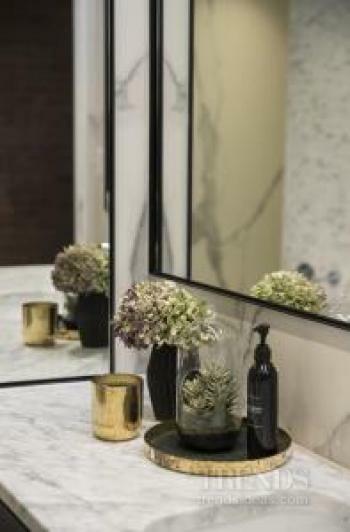 "The soft-toned porcelain panels work well with the vanity's waterfall marble benchtop and mosaic tile blade wall." 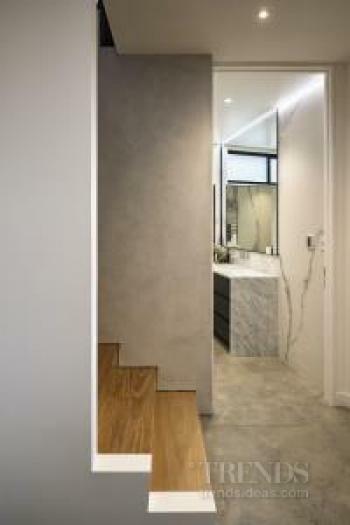 The marble mosaic blade wall partly conceals the wall-hung toilet behind it on one side and the walk-in shower, complete with an invigorating rainhead, behind it on the other side. 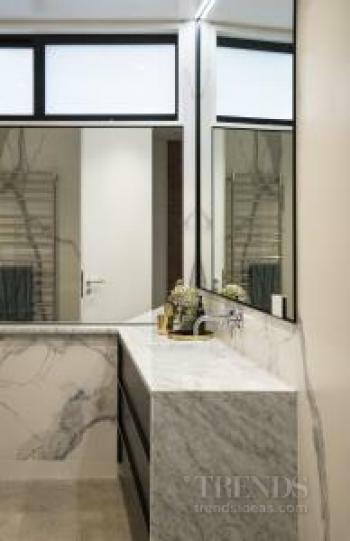 Tiny Alarti Marble tiles on the blade wall provide a dramatic contrast to the large-format porcelain panels. The wall also highlights the large freestanding stone bath in front of it. "The sculptural, egg-shaped bath provides a centrepiece to the room," says the architect. In contrast to the mainly restful, quiet tones, all joinery and cabinetry elements are framed in black, including the mirrors. Smith says this provides a ‘visual direction' to these elements. 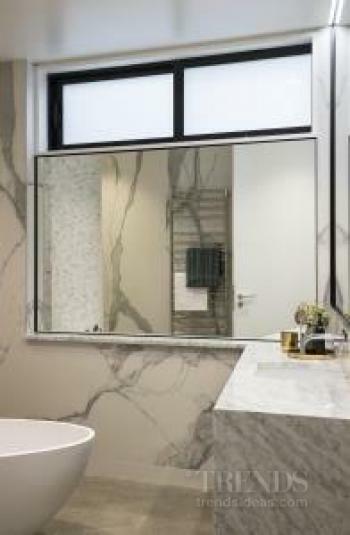 "The different heights between the two wall mirrors highlights both the shifting levels in the home and the frosted window." Soft, understated lighting, including recessed LEDs within the ceiling space, adds to the bathroom's feeling of intimacy and calm. 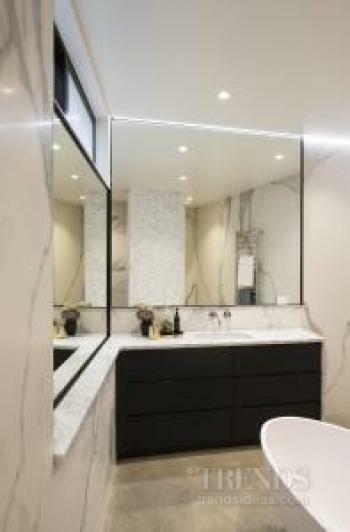 "Along with the bathroom's harmonious material palette, our minimalist treatment of the surfaces and joinery further reduces unnecessary visual stimulation and adds to the room's overall feeling of serenity," Smith says. "Generous storage in the vanity completes the picture of practical luxury."